We all make mistakes. It even happens to the 'old hands' of the industry from time to time. 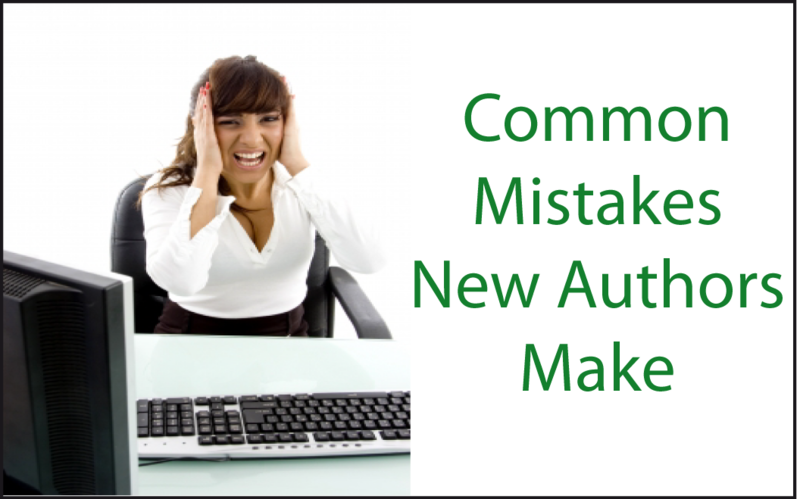 There are however some common mistakes that new authors often make. Whilst it's good to believe in your talent and everyone dreams of being the next big thing, you're likely to end up disappointed if you don't set realistic goals for yourself. By all means aim to become a #1 New York Times Best Seller with your first ever book but set yourself some more achievable goals too. As a new author you don't have name recognition yet to help with sales. It would be much more realistic to aim for best seller (top 100) in a specific category. It takes time and effort to reach the big leagues and you'll be hard pushed to find a real over night success story. Not being open to criticism. So you've written a manuscript and, in your opinion, it's amazing. You've spent a considerable amount of time pouring your heart and soul into it and call it your "baby". Having it pulled apart would break you. Whilst criticism can be hard to take, it's necessary if you want your work to be the best it can be. Being open to constructive criticism can turn your OK manuscript into something far better. You may well find that you were blind to errors you made because your idea was so strong in your mind that you didn't see them. Having fresh eyes read your work and give feedback can make a huge difference to the end result. This applies to all elements of the publishing process. From the writing of the manuscript to submissions to marketing. You should know the genre you're writing. What authors and books are your competition? What are readers in your target market reading? Is your manuscript the right fit for the Publisher/Agent you're submitting it to? How well are books in your niche currently selling? What is selling better, print or ebooks? Where does your target market "hang out"? What sites are they visiting? Rejection is something you just have to deal with. In this business, not being rejected means you're not trying hard enough. OK, so it can happen that you're a one-in-a-million writer that never gets a rejection but that's not very likely. Even big name authors like Stephen King have been rejected. Publishers only tend to take on a limited number of books per year and competition is huge. It's not just about talent. It's a numbers game too. Rejection can also come in the form of a bad review. It's hard to read that someone doesn't love your book as much as you do, but it can and does happen. You need to take it in your stride and not let it get to you. It's not easy but if you have thin skin this isn't the industry for you. Accept rejection gracefully and move on. The only way person can stop your writing career is if that one person is YOU! Waiting until the book is out before thinking about marketing. Marketing needs to start before you've even finished writing your manuscript. Especially if you're a new author. You need to build your platform so you have people to market to. You want people to be excited about your release so it sells when it comes out. Not release it and then have to hope people come across it. You should be building your marketing plan as you write your book. Marketing takes time and effort and so doing a bit along the way will make things run a lot more smoothly when the time comes to launch your book. You'll also find that you have a much clearer idea of the strategies you'll be using to promote your book. What common mistakes do you see new authors make? Did you make a mistake as a newbie? Share in the comments section. The biggest thing I've seen in the world of self-publishing, is that some new authors aren't hiring editors before they publish their work. They say, "I can't afford an editor, so I'll just edit it myself and publish it." I've read soooooo many self-published books lately that are... well... crap... because the author didn't have them edited before they were published. I'm a self publisher and I agree with you 100%. If you can't afford a professional editor then you should as least be joining critique groups. Alternatively do an edit swap with a fellow author. It's important to get another person to edit your work. I would never publish anything without getting it checked by another person first. You'd be surprised at how many little errors you, the writer, don't see when editing yourself.